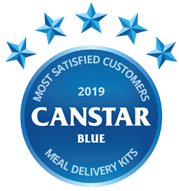 Compare Meal Kit Deliveries in New Zealand at Canstar Blue. My Food Bag, Bargain Box, Foodbox and Hello Fresh were compared on value for money, freshness of food, taste of food, variety of meals available, customer service, flexibility, delivery reliability/timing and overall satisfaction. My Food Bag rated number one for customer satisfaction. In this day and age, many of us are time-poor and are after a variety of healthy meals which don’t take long to cook. As a result, convenience is a big driver in purchase choice and with that comes businesses entering the market to help us out. Meal kit deliveries were introduced in New Zealand in 2012 when Master Chef winner Nadia Lim joined forces with Theresa Gattung and Cecilia Robinson to create My Food Bag. Since then, well, the market has flourished and the service seems to be popular now more than ever. Meal kit delivery services essentially create recipes for a set amount of time, for a set number of people, and send the correctly proportioned ingredients to your door. As a result, the stress of organising meals after a busy day at work or caring for the family is relieved. So, it’s no wonder they’re growing more in popularity around the country. However, with meal kit services popping up all the time, seemingly offering an abundance of perks, it’s difficult to know which one rates better. We’re here to help and have asked Kiwis who have used a meal kit delivery service within the last 12 months to rate that service on a range of factors, including overall satisfaction, value for money, freshness of food and taste of food. My Food Bag snaps up this year’s meal kit delivery star ratings win, gaining 5-stars for overall satisfaction, freshness of food, taste of food, customer service and delivery reliability/timing. Hello Fresh wasn’t too far behind, rating 5-stars for value for money and 4 out of the 7 remaining factors. Bargain box was rated 5-stars for flexibility and 4-stars across the remainder of the board. And, FoodBox was rated 3-star for all factors. Meal kit convenience: If you find yourself wishing there were more hours in the day, or you’re only just getting everything done before falling into a restless six-hour sleep, meal kits could make life easier. 82% of Kiwis said they use a meal delivery kit for convenience. Meal kit deliveries can save you the time and effort of planning each and every meal, and then making trips to the supermarket to purchase the perfect amount of ingredients for those meals. Meal kit services lay out fast and easy recipes, perfectly matched to the ingredients sent to your door. You may even save on food waste as 65% of our survey respondents said they have less food waste as a result of meal kits. Meal kit prices: As at February 2019, the price of a My Food Bag meal kit of 5 recipes for a family of 4 is $159.80. However, food kit delivery services usually tend to have a discount for a first week trial. In this instance, My Food Bag currently offers 30% off, lowering the first week’s price down to $111.86 with free delivery. Keep in mind, this doesn’t include breakfast food, lunches, snacks and food for 2 days a week. According to Statistics New Zealand, the most recent Household Expenditure Guide – conducted in 2016 – revealed a family of 4 in Auckland spends $358 on food each week. Whereas, the South Island average is $310 a week. So, if you spend around the Auckland household average and unless you spend more than $198.20 – the remainder left after the My Food Bag meal kit – on breakfasts, lunches and weekend groceries, then meal kit deliveries could be a good option for you. And in Canstar Blue’s survey, 33% of Kiwis said they think they spend less on a meal kit service than they would at the supermarket. Now, lets take a look at how this compares to other meal kit deliveries of 5 meals for 4 people. Hello Fresh also offers 30% off your first box, while their prices are currently sitting at $189.80. With the discount, the first week comes to a price of $132.86. Bargain Box, one of the cheaper options on the market, marks their prices at $129.99 with a $10 delivery fee. Their sign-up deal includes a free starter park worth $24.99 with your first delivery. FoodBox is the cheapest meal kit we rated which charges $134.09 and with a compulsory chiller pack, the cost comes to $147.59. Although, this doesn’t necessarily mean you have to be buying for 4 people, you could always purchase these as a couple and use the leftovers for lunches. And of course, there are plenty of options such as meals for 2, for 3 days a week, or 4 days a week, and so on. Healthy meal inspiration: Meal kits are, usually, a faster way to make home-cooked meals and are a cheaper and healthier alternative to eating out. Depending on the company you opt for, each meal usually ranges between $5.60 and about $11, and are most definitely healthier than fast food options. Meal kit delivery services pride themselves on providing fresh and healthy ingredients and some even offer health-focused kits and vegetarian kits to cater for a variation of diets. If you’re feeling lost for inspiration when it comes to healthy meals, we recommend you test a meal kit out for a couple weeks then re-use the recipes, but with your own ingredients. This is easily done as you can cancel meal kit services at any point and buy one-off weeks if desired. A substantial 80% of Kiwis said they’ve tried new foods as a result of meal kits. Meal kit companies, generally, share their recipes online and you can find My Foodbag recipes here. Canstar Blue commissioned I-view to survey 2,500 New Zealand consumers across a range of categories to measure and track customer satisfaction. The outcomes reported are the results from customers who have purchased and used a meal kit delivery service within the last 12 months. In this case 414 New Zealanders.